In this post I will show which steps are required to create an Android application with Groovy and how Groovy can simplify Android application development. A few days ago Groovy 2.4 was released. One of the major pieces of news is that Groovy now officially supports Android application development. 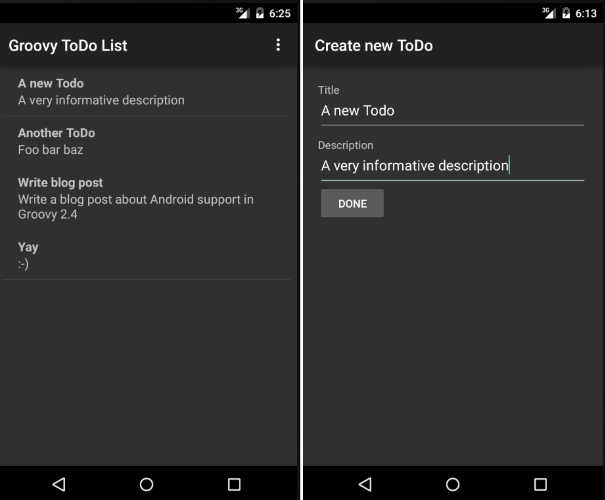 To see how this works I used Groovy to create a small ToDo list example application for Android. In this post I will show which steps are required to create an Android application with Groovy and how Groovy can simplify Android application development. The following screen shows the example application written in Groovy. You can find the full source code onGitHub. First we need Android Studio which already contains the latest Version of the Android SDK. Over last year the default Android environment changed from Eclipse and Ant to Android Studio (build on IntelliJ) and Gradle. To run Groovy on Android we will need a Gradle Plugin, so make sure you are not using the old Eclipse/Ant based development tools. 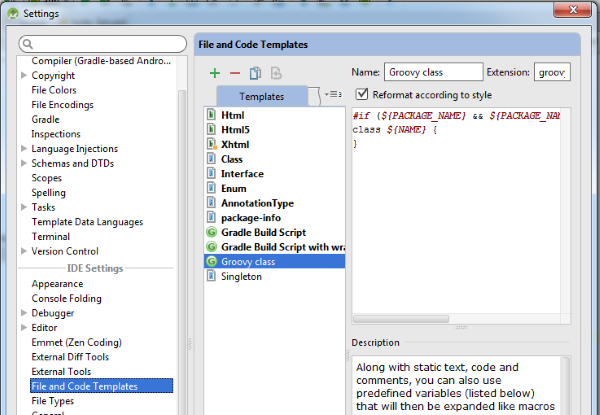 Source and documentation of the Groovy Android Gradle Plugin can be found on GitHub. This is all configuration we need, now we can move straight to Groovy code. Please note that Groovy code files need to be placed in src/main/groovy instead of src/main/java. Adding Groovy files to src/main/java will not work! Developing Android apps in Groovy works exactly the same way as in Java. Because of Groovy's Java interoperability, you can use and extend Android classes like you would do in Java. Android Studio already contains the Groovy plugin. So, you get Groovy syntax support out of the box. You might also look into this plugin which fixes the issue that you get no auto completion when overriding super class methods in Groovy. Thanks to @arasthel92 who told me about this plugin. Running Groovy apps is identical to running Java apps. We can simply press the run (or debug) button in Android Studio and deploy the application to a connected (or emulated) device. The cool thing is that the Groovy debugger works out of the box. We can debug running Groovy applications from Android Studio. The cool thing about Groovy is that it reduces the lines of code you need to write a lot. Its dynamic nature also lets you get rid of all the type casts that are typically required when working with Android. Groovy's closures are another feature that comes very handy when working with Android. See CreateNewTodoActivity for a complete example. Dynamic languages typically tend to increase the number of errors you find at runtime. Depending on the app you are building this can be a serious issue. Larger Apps can have a significant deployment time (the app needs to be packaged, copied via USB to the device, installed and started on the device). The downside of @CompileStatic is that you can (obviously) no longer use Groovy's dynamic features. It is very easy to get Groovy running on Android. Because of Groovy's interoperability with Java it is also very easy to mix Groovy and Java in the same application. The Groovy integration in Android Studio is actually better than I have expected (however, some manual tweaks are still required). Published at DZone with permission of Michael Scharhag , DZone MVB. See the original article here.